The Salmon Run is one of the great state QSO parties. This year, it was held on the 17-18 September. Six years ago, the Salmon Run was the first state QSO party I ever participated in, and the first mobile contest I ever participated in. I’ve done every Salmon Run since, and learned a lot since that first contest in 2010. One thing that has greatly changed over six years is propagation. Conditions were a bit tough this year, from what I could tell, although not nearly as bad as last year, when a solar flare wiped out the bands for much of the contest. The only thing one can do is make the best of whatever the sun dishes out. And have fun trying. The day before the contest, I published my route and schedule. This is, pretty much, the route I’ve followed for the past 4 years, although I spent a little time tweaking the route, and some more time unsuccessfully trying to find major improvements. 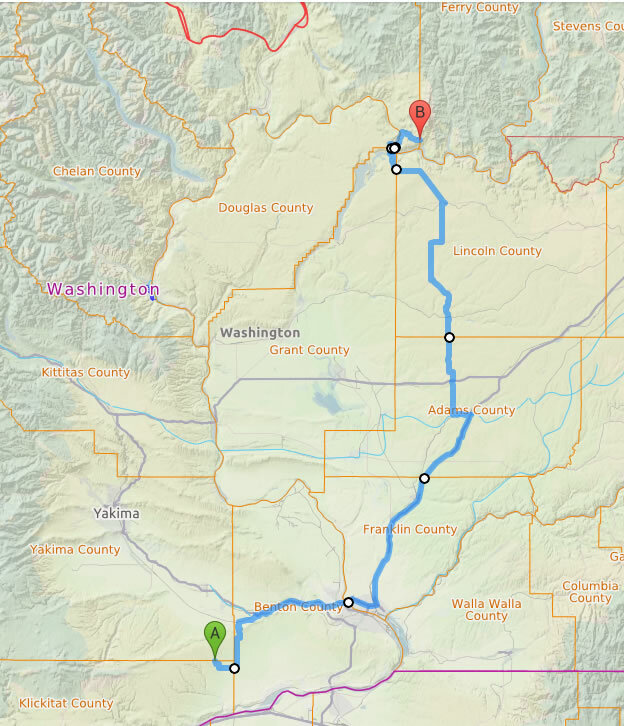 The two-day, 22 county trek would begin an hour southwest of my home in Redmond on the King–Pierce county line and would end a little east of the Grand Cooley Dam on the Okanagon–Ferry county line. This map shows the Saturday route. 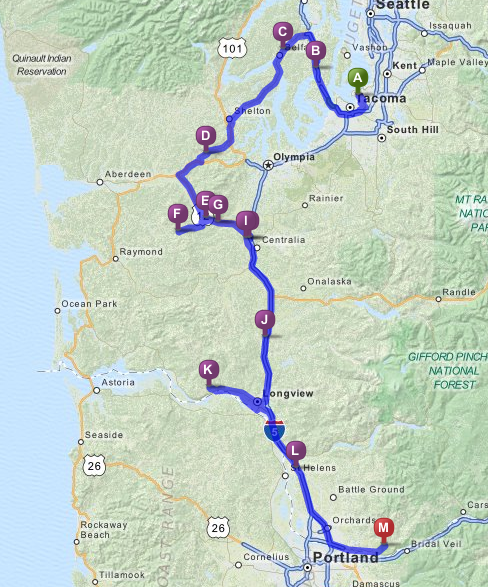 It begins on the King (KING)–Pierce (PIE) county line and then goes through Kittitas (KITS), Mason (MAS), Grays Harbor (GRAY), Pacific (PAC), Thurston (THU), Lewis (LEW), Cowlitz (COW), Wahkiakum (WAH) and ends on the Clark (CLAR)–Skamania (SKAM) county line for the last hour or so until the contest suspends at midnight. Sunday morning begins with a 2.5 hour drive to Eastern Washington before the 9:00 am starting time. The contest resumes at 9:00am on the Yakima (YAK)–Klikitat (KLI) county line. The route continues through the Benton (BEN), Franklin (FRA), Adams (ADA), Lincoln (LIN), Grant (GRAN), and Douglas (DOU) counties, and ends on the Okanagon (OKA)–Ferry (FER) county line for the last 90 minutes. As in previous years, the primary contesting rig was a Kenwood TS-480SAT at 100W. A Yaesu FT-857D and an LDG tuner served as a second rig for exploring other bands. A second FT-857D monitored either 6m or 2m SSB, and fed a 2m and 6m brick for higher power . Finally, a pair of TYT-9800 quad band rigs monitored 6m FM, and several 2m FM simplex frequencies. The equipment rack. Note that the heads are remotely mounted. The black box on the left controls a remote antenna switch. This allows for quick antenna reconfiguration. A K1EL WinKeyer can be seen on top of the LDG tuner. The operating position has five remote heads (TS-480, 2 FT-857Ds, and 2 TYT 9800 heads) mounted on a piece of sheet metal. On top of the dash, two Android devices, and a GPS are mounted. One Android serves as a 24-hr clock and the other provides real-time information on the current county. A TomTom GO60 GPS (out of the picture on the left) is used to navigate, and is pre-loaded with the day’s route. The antenna farm included three home-built screwdriver antennas, one of the front center of the truck, one on the rear right side and one on the rear left side. A 10m 1/4 wave whip has two purposes: (1) it can be used for 10m in the event there is a band opening or a nearby QSO, and (2) it can be used with the LDG tuner for “investigating” other bands up to 40m on the FT-857D. A 6m whip and two 2m antennas were stuck to the roof with magnets for monitoring those bands. Three screwdriver antennas minimize the amount of time required for band changes. The antennas have two standard configurations. By day, they are set up for 15m (left rear), 20m (right rear) and 40m (front), and by night, 20m (left rear), 40m (right rear) and 80m (front). For this year, I added something new to the front antenna: a removable horizontal extension wire to create, while stationary, a near vertical incidence skywave (NVIS) modification for 80m or 40m. The antennas are optimized for the night-time configuration. The front (40M/80M) screwdriver has a large capacitance hat. Additionally, the whip is cut so that the antenna is just under the legal height (14′ in Washington state) when tuned for the CW portion of 80M. The 20M/40M screwdriver has a smaller capacitance hat and, again, the whip is cut so that the length is barely street legal in the CW portion of 40M. The 15M/20M whip is a bit shorter and has no capacitance hat so that it can tune to 15M phone portion of the band. I spent much of Friday installing equipment and making other preparations for the contest. Everything was installed, tested, and antennas were calibrated by Friday night. The journey began at 7:30am for the 75 minute trek to the first stop on the King–Pierce (KING/PIE) county line. After arriving, I spent the few minutes remaining before the contest to explore the bands. This revealed that 20M was open to Europe for the Scandinavian contest, 40M had some local activity, and 15M was dead. I began on 20M CW, and first worked OG30OJ. Domestic signals were not great on 20M, but I managed 17 CW QSOs in the first 25 minutes before turning to 40M CW for about 15 minutes and half a dozen QSOs. The log then shows me moving between bouts of 20M and 40M CW with a brief foray to 20M SSB. I also called CQ on 2M SSB and worked one station. That was it for 2m for the rest of the contest. In all, I made 38 pairs of QSOs at the opening county line in a little under 2 hours. Several years ago, from the same spot, I made at least double the QSO count. My assessment was that the bands were in mediocre shape. Making QSOs took some effort. Long “runs” of QSOs were not likely to happen often. That is how it would be for most of the contest. Of course, some of the “bad conditions” could reflect reduced participation or changes to my station that made things worse, but at least the latter seems unlikely as I’ve used the same radios and antennas in recent year, but now have more efficient antennas from the longer whips. It was a 30 minute trip through PIE and Kitsap (KIT) to my next stop. Part of the trip was through heavy traffic, so I didn’t work on making QSOs. Still, I managed to work SM5COP, LA8OM, LY3T, and OG3G while in-motion! A spell on 40M yielded a handful of QSOs. The next stop was on the Mason (MAS)–Kitsap county line on a little dirt road I used for the first time last year. This is an excellent, secluded location. The 40 minutes spent there did not feel very productive with only 21 pairs of QSOs. The contest next took me to the Grays Harbor (GRAY)–Pacific (PAC) county line along a gravel road west of Oakville, WA, about 1/3 of the distance to Raymond, WA. Here, I first set up and tried the NVIS antenna for 40M. It seemed to work well. Overall, however, the QSO rate happened at the same rate, about a QSO every 2 minutes (but worth 2 QSOs each for being on a county line). Sitting on the Grays Harbor–Pacific county line. A 30 minute dash to the Thurston (THU) and Lewis (LEW) county line produced about 30 in-motion QSOs primarily on 20M CW. Once I was stopped on the THU-LEW line, the QSO rate slowed down (uggh!). Eighty minutes later, I had about 43 more QSOs. Last year, from this same location, at the same time, I had twice the QSOs. Twenty meters fizzled out by the time I left Lewis county and hit Cowlitz (COW) county. The rest of the evening was all 40m and 80m. When I got to the Columbia river, I took a road up-hill to higher elevations in Wahkiakum (WAH) county. Here I set up the NVIS attachment to the front antenna and got busy, primarily on 75M SSB and 80M CW. Ninety minutes in WAH only produced 41 QSO, but I worked many new Washington counties. At 0400Z, I headed back through COW and into Clark (CLAR) county for a 90 minute journey to my last stop on the Clark–Skamania (SKAM) county line. Sadly, the QSO rate tapered off to almost nothing. My last QSO was at 0638Z, and I continued calling CQ until 0700Z (midnight local time). At midnight, I headed east, a little way past N. Bonneville to a motel for the night, and hit the sack at about 1:00am (local). The totals for day one of the Salmon Run were 326 CW QSOs and 82 SSB QSOs, for a total of 408 QSOs. (Last year the day-one total was 448.) Aside from one 2m QSO, all the action was on 20M, 40M and, after 0230Z, 80M. Five hours later, I was getting ready for day two of the Salmon Run. I hit the road by 6:30am (local) for the 2.5 hour drive to the Yakima (YAK)–Klikitat (KLI) county line. I spent about 55 minutes working mostly 20M CW, with a few phone QSOs sprinkled in. I did manage three 15M QSOs with east coast stations, and a 40M CW QSO to MT. After leaving YAK–KLI, I headed toward Benton (BEN) county. K2SSS called me on 20M SSB with the KLI–BEN county line sign in sight, so I pulled over for a few minutes to work several stations. From Benton, I drove into Franklin (FRA) county and then to the FRA–Adams (ADA) line for a 15 minute stop. The QSO rate picked up a bit here giving me 27 non-duplicate QSOs for the stop. The 30 minute drive from Adams to Lincoln (LIN) county produced one 15M CW QSO, a few 20M SSB QSOs, and 14 40M QSOs. The drive through Lincoln county is over 1.5 hours long but only yielded about one QSO for every three minutes, mostly on 20M CW, but one on 15M CW and a couple on 40M CW. After the contest, a 4.5 hour drive home was before me. But before leaving, I took the screwdriver antennas down to save them the wear and tear of the highway. For the first 30 minutes, I simply enjoyed the silence. Eventually, I turned up the radio and listened to classic rock and the blues. It was a pleasant trip home. After eliminating duplicates, 719 QSOs were made–a little over 100 more than last year. 590 of these were CW and 129 were phone. Like last year, I only worked W7DX on CW, for 500 bonus points. Multipliers included 38 states, 28 Washington counties, four Canadian provinces (AB, BC, MAR, ON), and six DX entities (JA, LY, OH, OM, SM, UA) for a total of 76 multipliers. Last year, I worked far fewer multipliers. Therefore, I spent a lot more time on 40M and 75/80M, particularly SSB, trying to pick up more multipliers. The strategy worked. The final preliminary score, including the 500 bonus points, was 154,628. This was way up from last year’s 119,636, but still down from my 2014 score of 200,927. This was a fun Salmon Run for me. Almost everything went quite smoothly; I made lots of QSOs, nothing broke and I didn’t get lost. I’m looking forward to the next one.